Born in Breznice, Czechoslovakia, Dennis Tupy founded Canadian Ceramic Craft in 1960. Tupy had immigrated to Canada in 1951, founding Blue Mountain Pottery with fellow Czech Jozo (Josef) Weider in 1953. 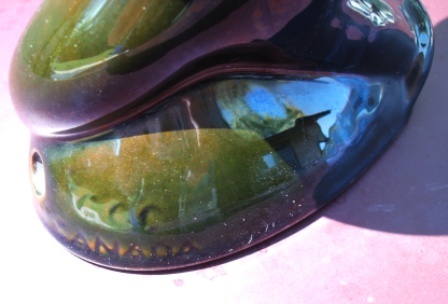 Tupy was a skilled mold-maker and designer, creating many classic designs for Blue Mountain. When he left to form "CCC", he did so in the plant that originally housed Blue Mountain in Craigleith, Ontario. The pottery was moved to Collingwood in 1966 as Rainbow Ceramics, and was active until sometime in the '80s. 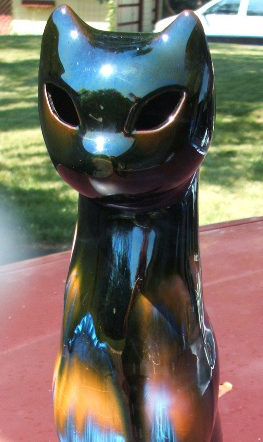 Looking much like a product of Blue Mountain Pottery, this cat was made by Canadian Ceramic Craft. Photos courtesy of Char Korcz. The marking reads: CCC CANADA. Now here's a cat of a different color! Canadian Ceramic Craft applied a beautifully colorful glaze to this one. Photos courtesy of Char Korcz. 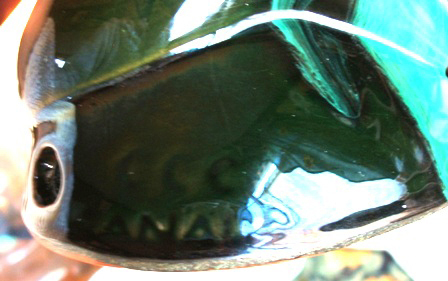 As with the previous lamp, this one is marked, CCC CANADA.